Last weekend, we made our way towards the East of Jordan to explore the Desert Castles and the Azraq Wetland Reserve. I have been to the East ten years ago, but can’t remember exactly which places we have been to. This time we went the South route number 35, which is a bit shorter/faster but also less comfortable as opposed to the 40, which you can take on the way back or vice versa. If you go straight to Azraq Wetlands it takes about 1.5 hours from Amman. After 1 hour you will reach the first castle – Qasr Al-Kharaneh, which is well preserved/renovated and has a stunning look from the outside. Popping up in the middle of nothing, I always wonder, who created those places and what the purpose was. Reading some explanations, it seems that scholars until now are not 100% sure, although of course, some assumption exist. It is believed to be built before the 8th century and an example of early Islamic architecture although it has several different influences. There is courtyard inside and you can go upstairs and basically walk around the whole castles once. It is also the most well-known castle and probably biggest of the desert castles. About 15 minutes after the first castle, continuing East on route 40, you will reach Qasr ‘Amra, which is a Unesco world heritage and of similar age. Several fresco are painted on the walls and the Zodiac painting on a dome ceiling is the most anticipated by travelers although not in a good condition. The area is fairly small as these are just the remains of a larger complex that once was there. Another 20 minutes on the 40 and you will reach Azraq Wetland Reserve. It is one of the Nature Reserves established by the The Royal Society for the Conservation of Nature – RSCN. Azraq Wetland Reserve used to be a huge water reserve where various species lived including lions. Birds used it as a resting place on their journey between South and North. However due to the consistent pumping of water to the cities of Azraq, Irbid and Amman it was fully emptied around 1990. After that people slowly began to restore the reserve as much as they can. When I visited 10 years ago, I haven’t seen any water. Due to the efforts of the RSCN, government, the Ministry of Tourism and several international projects, some parts have been restored and you can actually see fishes swimming in water and observe birds in the reed. It is still not extremely overwhelming but nice to spend some time as it is quiet and you will enjoy being outside of the city. There is a circular walk of about 1.2 km which takes about 30 mins. You can take a small break and observe some birds in between. 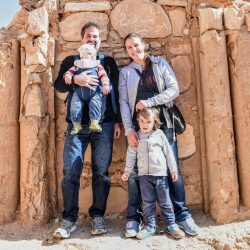 Keep in mind that we travel a bit slow, since we have young kids and also we live in Amman, so there is no pressure to see everything at once. We went to the Azraq Lodge which is a renovated military barrack originally built in the 60ies. If you intend to eat there, it is better to call before and informa them. We were lucky and got something anyway. If you have more than one day, you can stay overnight and explore one of the many activities offered in the region. 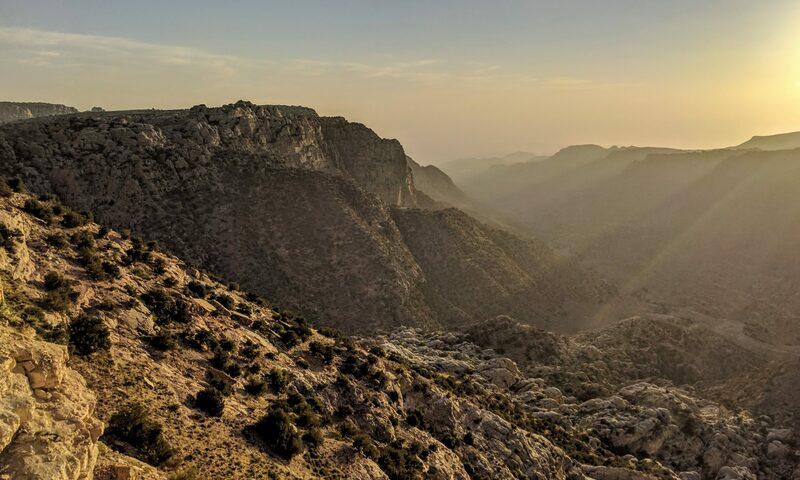 This includes a bike tour, a bus tour, a jeep safari in the Shaumari Wildlife Reserve or a visit to Azraq Castle, which is built from black basalt stone. I visited it 10 years ago and it is a pretty big structure and looks interesting. If you return, you can take the route 40 towards Amman, which is in much better condition for most of its parts. However, there is more traffic in Zarqa and closer to Amman later. If you haven’t seen enough stones by then, check out Qasr al-Hallabat al-Sharqi.